Last month of October I had the idea of celebrating the month with several events featuring the Italian Life In Style and bringing some directions for easy, understated and classic style for your parties. Being a designer with a passion for kitchen designs, good food and stories related to food, it is only natural that I would bring “to the table” the trends to make unforgettable stylish parties. My trips to Europe, other than visiting family and friends are an added excuse to browse in retail stores and take notes of all the beautiful merchandise, display styles, fill my eyes with colors and overflow my mind with ideas. Invitations to friends’ homes are inevitable when I am there, they are my lifetime friends. Just that in itself is a precious opportunity to study their customs and learn what is going on across the Ocean. 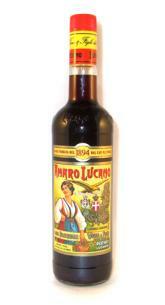 My attention last autumn 2010 had fallen on the resurgence of the after dinner liqueurs, cordials, apéritif and digestive drinks, or “digestivi” as we Italians would call them in our language. Digestive drinks have been used for centuries to help settle the stomach after a large meal that sometimes can last for a few hours. Italians are famous for getting together for lunch or dinner and easily forget time! Digestives also have the property of cleansing and detoxifying, facilitate digestion, eliminate toxins and at times help reflux problems. They are made mostly with natural herbs, roots, tree barks and spices, infused in a base of alcohol. Due to all the herbs they were originally considered more medicinal to resolve digestive problems than drinks to enjoy. It is recommended not to use them in large doses, because they are vasodilator, only small sips will be favorable to the digestion. Due to their bitter taste, digestives have had hard time appearing on the tables in the US until a few years ago. We can now find them in upper scale restaurants and in people’s homes along with aperitifs and palate cleansers between specialties. Fruit sorbet will do just that when served after a fish dish and to the contraire of digestives, they are vasoconstrictors and will ease the digestion by lowering the temperature in the stomach. Apéritifs are a prelude to a good meal and often served one hour before lunch or dinner. In Europe going out for an apéritif is a way of socializing with friends or family. It is an occasion to see and be seen, gossip, to show the newest fashion outfit and the best part is that ingesting an apéritif will enhance the appetite. In order to make these kind of drinking activities even more fun and pleasant, we need to own special glasses. Holding an elegant, or an interesting designed glass in our hands exalts the pleasure, I know it’s a cliché, but we eat with the eyes first. 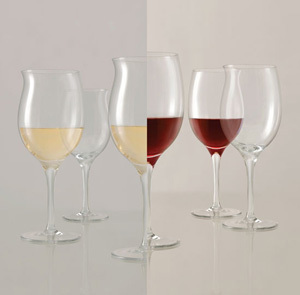 In my photo on the right, I am showing tasting wine glasses, curved lip side for white wines and regular lip side for the red wines, all in one. On the other side, I am showing the elegant 2010 new glasses collection made by Italian company Richard Ginori, producing ceramics, porcelain, pottery and glasses since 1735. This is pure elegance! 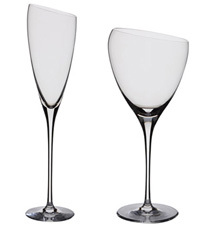 In my second book “Sins Of A Queen” I have included a small chapter on glasses to serve with apéritif and sweet wines.